We are in Ouistreham near Caen, another French coastal town with yet another group of young refugees, this time nearly all from Sudan. 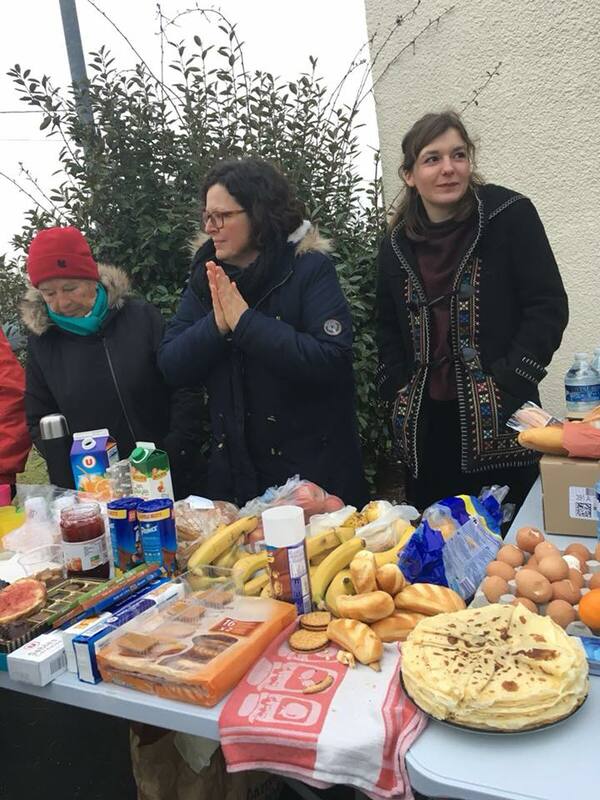 French locals gather to distribute hot food and even some clothes they have collected and a small girl walks around smiling happily and handing out sweets. These locals are genuine and kind and are doing their best for the young men, even accommodating some of them in their homes, but they have no money and are unable to replace all the tattered shoes or provide enough of the desperately needed sleeping bags the boys need. The previous night, Care4Calais distributed long-lasting, durable items with refugees choosing the thing they needed most and now, in the light of day, new boots are on display and one man says to a French lady that he had his first good night’s sleep in weeks. Your donations really are making a difference to people’s lives and the French group, all smiles and warm faces, are grateful to us for helping “their” boys. Where does it all come from, they ask? From Britain. They are impressed but we are just as touched by their efforts, it’s easy to help as a foreign outsider but it’s definitely much braver to make a stand in your own town. Leaving Ouistreham on our way back to Calais, we stop opposite the supermarket to have a quick look at the encampment we have been told about in the woods down a small dirt track and to make sure no one has missed out on distribution. There is no one about but we see tents and a few make-shift shelters. It is a surreal sight, a quiet refugee camp in amongst peaceful fields of beautiful horses and it makes us realise just how big this problem is. Despite the pleasant view, there are no solid walls, no warmth, no toilets or sanitation facilities and the men told us it is getting harder and harder to cross from Ouistreham. We hope they don’t have to stay here too long.